Walks are wonderful for inspiration. My son picked a couple flowers that had fallen and we put them on water when we got home. I have forgotten where they came from, since there was a clover with them, I gave it that background. I wanted to work on layering and focal point emphasis on this piece. So the things closest to us are sharper, have more detail and are a little brighter. I think the flower achieves the effect with the contrast of color with the green and all the details. The clover can use another try. On a more recent walk I found the flower! and while the leaves are quite different, the greens had a similar effect. This year I decided i was going to focus on painting, I visualized myself by the easel working on big paintings, but it wasn’t flowing. I had to start somewhere, so starting with a little one helped things roll. I’ve been taking pictures of what catches my eye, so I have my visual reference and to make it less possible to find excuses I have a list of possible themes and topics. Even then sometimes it is difficult to get going. So what then? 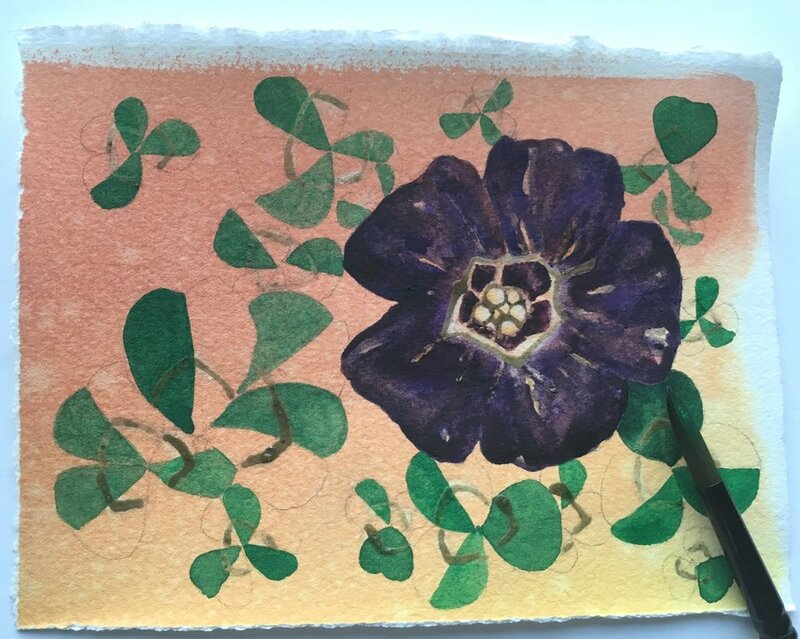 I grab a random piece of paper and combine memories, flowers and clovers that may not go together, may not be spectacular, but helped me see 1 new way to approach a painting. Lots of good luck clovers to you this week!